Glowcare have been accredited approved agents for the Icon & Ikon combi boilers, since 1999. We provide fast and flexible cover for our customers across Cheshire, Lancashire, Manchester and Liverpool. We also serve many other local places in North West England. 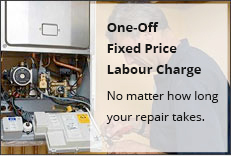 We would always expect faulty, broken or leaking boilers, to be back up and running again in just a single visit, with no major problems. A full vanstock of icon parts is always carried. Please view our Testimonials page to see how customers rate our service. All parts and labour carry a one year guarantee.